I have been writing a blog for about four years. My other blogs are, www.wecookwecraft.com, and www.vaboozer.com. But I’ve never really been successful at making it my full time gig. My goal is to quit my “day job” and make blogging my complete focus. I started my journey with My Clean Kitchen(MCK). We had so much fun creating MCK. We started it with the plan of making it a full time job, scheduling, strategy planning, etc, but we quickly got burnt out as we didn’t make any money. Granted, this was at the start of the blogging boom, and affiliate marketing was fairly new at the time. So instead of sticking it out, we let it slip in priority and eventually got “real” jobs. The blog began to suffer and we didn’t post for years. Yes, years! But, the good thing is that we decided to keep it up and would occasionally maintain it. Now that I’m focusing my time on it again, I hope it make it great! I recently added We Cook We Craft and Virginia Boozer to my repertoire and plan to make each of the sites as great as they can be for my readers, as well as earn a living in the process. Launch Your Blog – I did not take this one, only because I already had my blog launched, but may go back and take it later. I’m sure I’ll learn something! 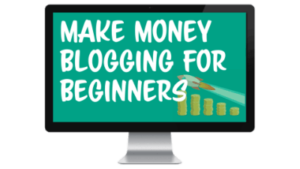 Make Money Blogging for Beginners – I’m doing this class right now. I’m really learning a lot. I am on track to start earning soon. I think! I’ll keep you posted. I’m planning to take the Pinterest Avalanche course in the next few weeks. Once I do, I’ll update this page with my experience. I currently use Go Daddy for all my website URL and website hosting. URL stands for Uniform Resource Locator, if you’re a nerd like me and wanted to know…and its basically your website address. Mine is www.mycleankitchen.com. I like Go Daddy because I get 5% back on all purchases with EBATES. (I love EBATES by the way, and you should totally sign up if you haven’t already!) At Go Daddy you can purchase your URL as well as your website hosting. Website hosting is where you’ll website will live and publishes your site on the public internet. I like to purchase my hosting for the full year because its cheaper. I know a lot of bloggers are committed to Blue Host, another hosting company, but I’ve never made the switch. I’m sticking with Go Daddy. With Go Daddy you can also access your CPanel where you’ll install Word Press as well as set up email address(s) if you choose to use them. If you’re new to Word Press I suggest the “Launch Your Blog” course from Create and Go. There is a section on mastering Word Press. WordPress is really the way to go when setting up your blog. When I first got My Clean Kitchen started, I used a simple theme. But as I learned more and needed more, I looked for a theme that would fit my needs. This is where StudioPress came in. I absolutely love the Foodie Pro Theme. I use it for almost all my blogs. It is a child theme of the Genesis Framework. The Genesis Framework makes it easier to set up SEO, includes social medial links and also image sliders. It improves speed and browser compatibility. It is required for Foodie Pro. There are so many companies out there that provide Word Press theme. Studio Press is my favorite. They provide fantastic support and their templates are simple to customize. Also, their documentation is well done. I use it a lot when I need to add something new to my sites. If anyone ever asks, they are my go to. I absolutely love PicMonkey. It makes is so simple to create engaging banners and graphics. They have a ton of templates that can help get your creativity started. I have been using them since I started my first blog more than 4 years ago. They just keep getting better. Even if you take your own photos, you’ll need stock images from time to time. I love this site, they have a couple of plans that make it affordable depending on how often you need them. I personally like the pay as you go plan, but the monthly plan would be a good option for those who use stock images more frequently. I also really like the photos on this site. They seem to fit my ‘style’ more than others I’ve seen. Through the years, I’ve tried several different affiliate marketing tools. So far Share-a-Sale has been the easiest and most profitable. They have the most vendors, and really good commission rates. They also take new bloggers. Amazon Associates is the Amazon affiliates program. Every blogger should belong. It allows you to create links to any product Amazon sells. So if you have that one brand of mustard you love and want to talk it up on your blog, you can post a link and potentially make a little money if someone buys it. I found this ebook helpful to learn how to use Amazon Associates. I also found this list of resources helpful. I’ll be adding more resources as I use them. I’m testing email tools right now. So far I’m loving ConvertKit. I’ve used MailChimp before. Once I determine which one I like best, I’ll be sure to add it here. Do you have a resource you love? Let me know and I’ll test it out.